We thank you for your continued prayers and support as our family makes this exciting transition to Nairobi, Kenya. There are ways you can help and partake in the Lord's work as our family serves Living Water Christian Fellowship. As our family prepares to move we ask that you consider supporting our family prayerfully and financially. Missionaries rely on God as the provider but God uses His people to partake in the support of missionaries. What does this mean? Missionaries receive their funding from people like you! I know that it is often times assumed that the church cuts a check to the missionaries to keep them out on the field. Although the church may provide some sort of financial assistance, missionaries stay on the field by individual givers. We ask that you would pray and see if God would impress on your heart to pledge monthly support for our family. It is important that we have pledged support coming in before we leave to assure we will have enough once we get out there and to stay out there. If you are not in a position to give financially, we ask that you would consider keeping our family in LOTS and LOTS of prayer. As we move forward in this process the enemy is throwing lots of opposition our way. Peace for our children, they haven't been sleeping well at night, causing lots of spiritual warfare my way. When I'm really tired at night, it's always a sure way the enemy attacks. For a new Jr. High pastor to replace Jonathan. For God to give us continued peace about our move and that our plans would be His. Also, I (Adrienne) have picked up my guitar again and am taking guitar lessons. Please pray that I would be diligent and focused on finally getting this instrument down and using it for the glory of God! Of the $4,030/mo. we need in Kenya, we currently have 5% committed. Our goal is 160 supporters who can give $25/mo. Car: $10,000-20,000 depending on many factors. Unfortunately cars are all imported and so there is a high tax on the vehicles there. We need something with good suspension as the roads in Kenya are very rough. We know that these numbers can seem daunting, but we know that our God moves mountains. 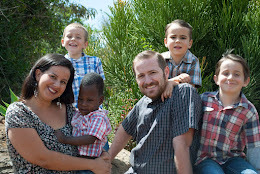 We are excited to announce that our family has had a change of plans concerning ministry in Kenya. Our family will be working with a church in Nairobi known as Living Water Christian Fellowship. We are so thrilled to come alongside Robbie and Elizabeth Gorden (Senior pastor) to serve at this precious church. A dear friend of ours, Rick Deam, passed away in December here in the states while he was on furlough (picture above). Rick was an amazing man of God and served in a wide capacity at the church. As we grieved the loss of our friend, a need presented itself. We prayed and sought counsel as we desired to do whatever God wanted us to do. As we proceeded in this direction, doors just flew wide open. There's an overwhelming peace and comfort from our Lord for this new direction. We are making a three-year (verbal) commitment to the church. We are also still looking forward to visiting Disciple Support Ministries while in Kenya. Which, comes to mind, please be in prayer for the Coopman Family (Bill, Brooke, little Ruby and Jonathan out of Calvary Chapel Beachside in HB) who will be moving to Nairobi, Kenya May 31st. We had planned a short trip to Nairobi in June which is now not going to happen. Our move to Kenya will come at the end of August. Please pray as we are raising financial support and as we get our young boys ready for shots, passports and everything else. 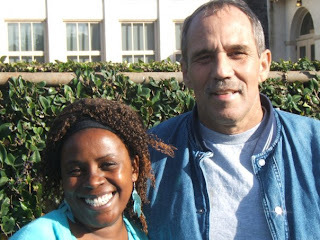 When Jonathan and I went to Nairobi on our first trip back in 2005 we met Robbie and Elizabeth Gorden. Back then, Robbie had a radio show that featured teachings through the Bible by Chuck Smith. It was amazing to see the message go out and hear the response from the people. We also got the chance to visit Living Water and meet the people. Elizabeth teaches the Bible to a group of Maasai Ladies and help with their crafts. In 2006 Robbie and Elizabeth welcomed Jonathan and I into their home for two weeks as we took our "vision tour". Our hearts were knit to the Gordens as we saw their daily lives and how they loved each other as well as the people of Kenya. On this second trip, Jonathan again got to visit the radio show Robbie was hosting, and help answer some of the questions people called and texted in. Jonathan also had an opportunity to teach at Living Water. We are so thrilled at this new direction and we ask that you stand and pray with us as we have many things to do between now and August. Please pray for Ruth Deam as she moves forward in ministry and life without her beloved Rick. We love you guys and thanks for praying!